Op-ed: Are Europeans turning against asylum seekers and refugees? A common assumption amongst political commentators is that Europeans are becoming increasingly opposed to the admission of migrants, asylum seekers and refugees into their countries. Moreover, it is supposed that this greater negativity is the result of hostile media coverage that has led to citizens voting for populist radical right parties. While it is indisputable that some citizens are opposed to immigration and that certain media outlets propagate similar sentiments, such an understanding runs contrary to the most common findings in the social sciences that political attitudes are remarkably stable. The so-called European ‘refugee crisis’—the phenomenon since 2015 of increasing numbers of people entering Europe across the Mediterranean Sea—provides a powerful case to test these assumptions. We can begin by asking a basic question: is there evidence that Europeans have turned against migration as a result of the ‘refugee crisis’? People fleeing persecution to seek protection are not immigrants, but between 2014 and 2016, Europeans tended to become more, not less, favourable to accepting migrants from poorer countries outside of Europe. The European Social Survey—one of the most high-quality sources of attitudinal data—asked citizens in 15 countries in 2014 and 2016 about their attitudes to immigration and found that during this period nine countries had become more favorable, four did not change and only two—Austria and Poland—became more negative. Moreover, of the 14 country populations that were investigated over the 14-year period since 2002, 10 had become more favorable. That Europeans are becoming more favorable to immigration, does not necessarily mean that they are sympathetic to allowing refugees into their countries. 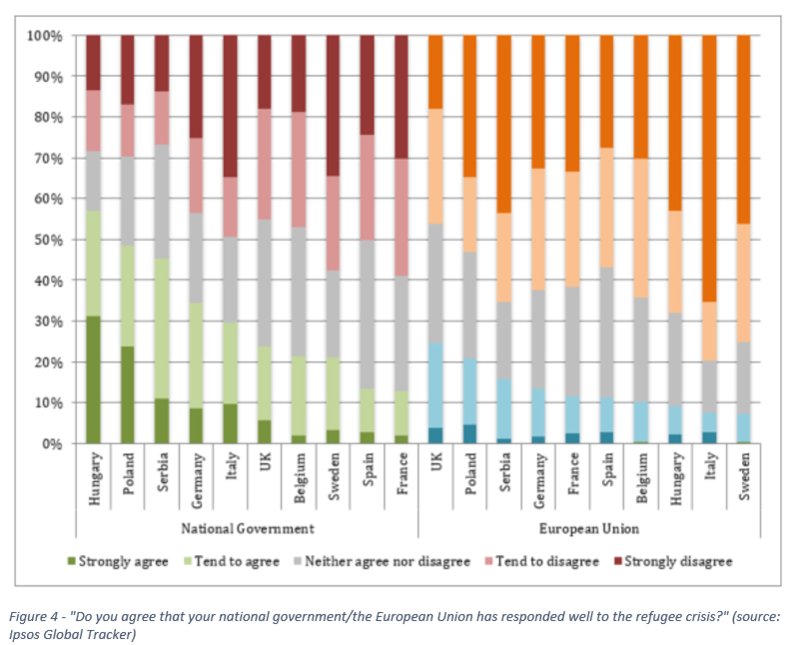 Yet even on this issue, in most European countries, a majority of citizens oppose ‘closing the borders’ to refugees. Only in Turkey, Italy and Hungary is there a majority in favour of ‘closing the borders’. This finding is even more stark when we consider that data from IPSOS show that most Europeans accept the idea that refugee arrivals could include potential terrorists or people with dubious claims to refugee status and the fact that data also suggest widespread skepticism that refugees are likely to successfully integrate. This presents a puzzle. 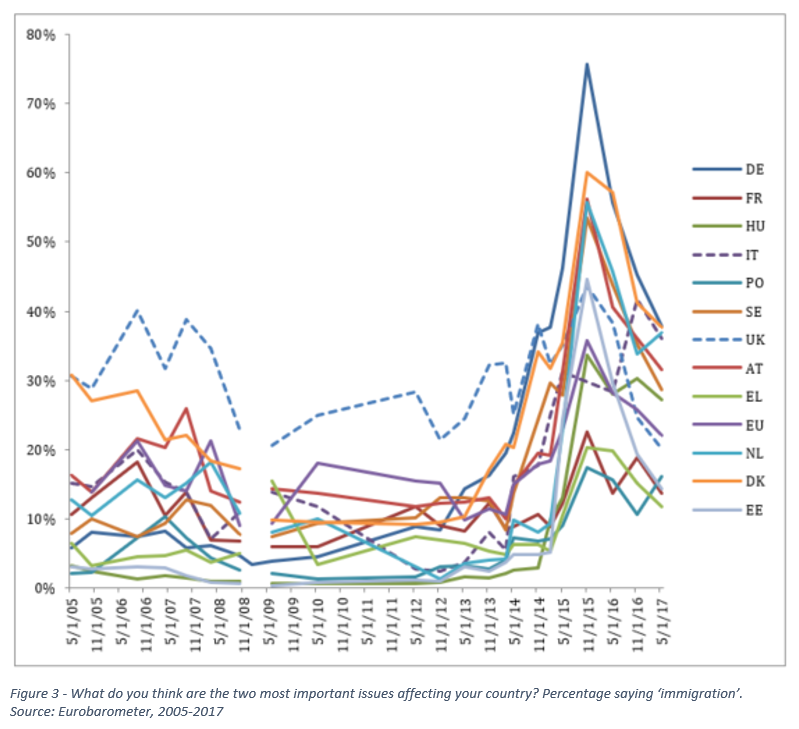 If attitudes in most European countries are actually becoming more favorable to immigration then how can the greater success of populist radical right parties through the period of the ‘refugee crisis’ be explained? The answer is the significance people attribute to immigration issues, or, to put it another way, issue salience. Whereas attitudes have been stable, data starkly demonstrates that there has been considerable volatility in the perceived salience of immigration as a political topic. The key thing to note is that after 2014 Europeans increasingly see immigration as an important policy area. There was huge spike in issue salience in Germany after 2014. As a forewarning for 2018, there has been a big increase in salience in Italy, which will hold a general election in 2018 in which populist radical right parties seem poised to perform strongly. The ‘refugee crisis’ seems to have had little obvious impact on Europeans’ attitudes to immigration generally, but perceptions of disorderly movements of people to Europe across dangerous sea routes has raised concerns amongst people who value security, order and societal conformity. In other words, citizens with a conservative value orientation. In this sense, rather than provoking a turn against immigration, the ‘refugee crisis’ triggered pre-existing latent attitudes amongst the one-third to one-half of each national population with such conservative value orientations. More universal, however, is the negative assessment that Europeans give of their national governments and, in particular, the European Union. In every country except the UK, the EU is perceived to have handled the refugee crisis worse than their national government. Only the Hungarian, Polish and Serbian governments are perceived to have handled the crisis relatively well by their citizens, which, given the content of their actions, is unlikely to be a positive signal for those who advocate a greater focus on international protection. This alludes to the perception that these national governments have adopted bona fide conservative positions, pleasing at least a sizeable segment of the population. By contrast, other national governments and the EU have adopted a neither-here-nor-there passive approach. An exception to this could be the German government, but, even here, the carefully accrued political capital of Chancellor Merkel and her one-time slogan of wir schaffen das (we can do this) was eroded by negative reactions to increased refugee flows that contributed to increased support for the Alternative für Deutschland (AfD). 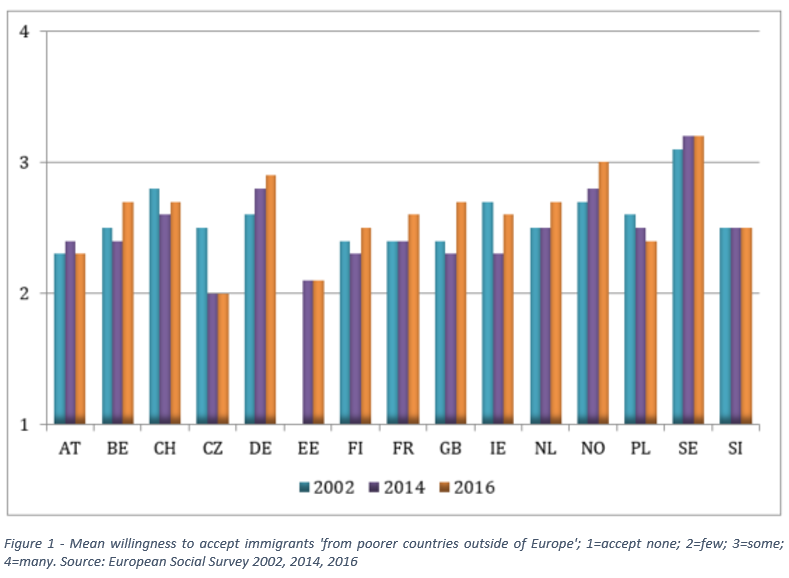 Overall, attitudes to immigration in Europe have remained relatively stable in recent years and, indeed, have actually become more positive in most countries, even during the deeper political and institutional crisis at national and EU levels exposed by the ‘refugee crisis’. 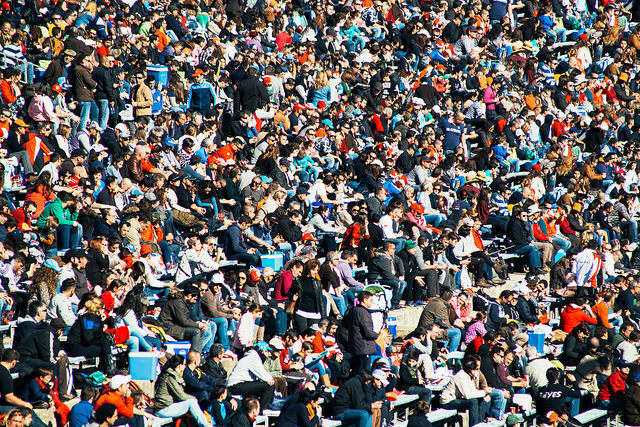 In most European countries—as is the case globally—people oppose shutting out all refugees. The increased recent electoral success of radical right parties such as the AfD in European elections can be explained, at least in part, by increased issue salience. Immigration is now considered far more important following the ‘refugee crisis’, only partially subsiding again in the last year. It seems that rather than convert people to anti-migration positions, the crisis has activated latent anti-immigration beliefs amongst those with ‘conservative’ value orientations. This, coupled with the near universal belief that the European Union and western European national governments have handled the situation poorly—to the dissatisfaction of both those on the left and right—has led to significant changes in European party systems. Though some have argued the populist wave had already peaked in 2017 after elections in Austria, France and the Netherlands, the ongoing high salience of immigration bodes well for anti-immigration parties at next year’s general election in Italy. In conclusion, the radical right benefit from the poor handling of the ‘refugee crisis’ at EU and national level, the more intense focus on the issue of refugees and migrants and the latent fear in some segments of European populations of disorder and chaos – but there is little to suggest a radical change of attitudes in the broader European populations.